There’s a new trend in town, and it might not be what you think. Whether you live in an apartment with a balcony, or a rented 2 bed semi with an overgrown garden, the new summer trend is to host a Growing Up Party! It’s where you gather your loved ones, and all muck in towards to a common gardening goal. Your vision could be to block out neighbours by tree-lining your borders, to pot some of your favourite herbs on your balcony for your kids to nurture or to create award-winning hanging baskets that even Alan Titchmarsh would be envious of. I recently threw a Growing Up Party after school, which involved me, my mum, my son and my daughter. The sun shined bright, and we had ice creams, party snacks, fruit salad, a few sneaky proseccos, and we all mucked in to create a masterpiece in my mum’s garden. Our tasks for the afternoon were to repot a few of my mum’s new plants that were reduced in Homebase, to zap the incredible amount of weeds on her patio, thicken her lawn, which had taken a battering from Fin running around on it over the years, and to give her plants a lovely dose of goodness so they grow up to look super nice and abundant! BLACK MAGIC® Potting Soil is the perfect product for time-poor millennials. It offers users fast results with less effort required to keep their space looking how they want it. It’s a new premium compost for young, urban consumers growing plants, fruit and vegetables. Suitable for both indoor and outdoor use, it boasts higher yields and faster growth than other products on the market. We really enjoyed repotting all the plants, and Fin loved his role of watering them all. His school uniform became a whiter shade of black in about 2 seconds flat (silly me for not bringing a change of clothes!). BLACK MAGIC® Black Elixir is the easiest way to feed and water your garden, instantly feeding through both leaves and roots. This is such a good idea, as it kills two birds with one stone for the time poor (aka most people with kids)! All you need is to measure out the plant food, add to your watering can, and away you go. Glove up, though. Weedol® PS Pathclear™ Weedkiller kills weeds to the roots and creates an invisible barrier that prevents new weed growth for up to 3 months. Ideal for use on gravel paths, drives, patios, along fences and walls and around established trees and shrubs. The weeds are quite cute in my mum’s garden, and they seem a nice colour of dark red! I felt bad zapping them, but they had to go. To help us with this task we were sent some Weedol Pathclear with a Power Sprayer! This sprayer is battery operated, and it made very light work of the weed killing. It also sprays in a light mist, so you don’t splash it everywhere and waste it. EverGreen® Complete 4 in 1 with unique Watersmart™ formula gives a thicker, tougher lawn! It kills weeds, moss and feeds lawns. Just the ticket! This is also a super easy product to get to grips with, and very quick to apply. I will post in the coming weeks, so you can see the results for yourself. Of course, this completely depends on the state of the garden at your home, but the main thing to consider is planning before you get started. Don’t go cutting back everything you see without devising an action plan and clear design. The ideal time to work on a garden is during the summer. At this time plants will be in full bloom giving you a great idea of what you already have to work with and what areas of the garden clearly do better than others. That means that now is the perfect time of year to get outside and get your hands dirty and it means your friends will be more than happy to get outside with you too. If you create a plan, however basic, you know that you have thought about how the garden will be constructed. 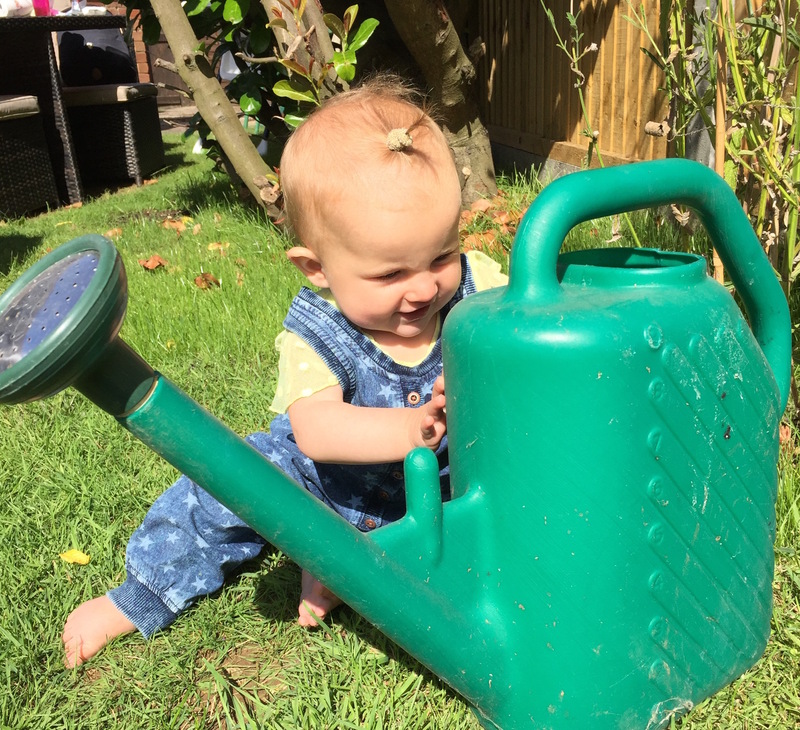 Your plan can be anything from stripping back hedges for planting or creating a productive vegetable patch, but as long as you know what you want to plant and where then you’re heading in the right direction to becoming a fully-fledged gardener! What if the garden is overgrown? Hidden wonders may emerge as you remove brambly corners of your garden. A crop of saplings may reveal a fruit tree or you may even find a vegetable garden that has been reclaimed by overgrown weeds. The best course of action at your growing up party is to work with your friends to cut back and weed what you can, taking a little time to get a feel of what was there before. Check out the plant finder to identify unknown vegetation. Working with your friends will help you speed through the little maintenance jobs and most importantly provide you with an outdoor space to be proud of to enjoy BBQs and long summer nights. So get those secateurs at the ready! Arguably the most important part of a garden overhaul is the introduction of new plants. Consider any existing plants and what will suit the space, as well as the growing conditions of your area – shady, exposed etc. This is a commonly neglected job in the garden. You can make your garden seem a lot bigger just by trimming back overgrown hedges and managing plants. Depending on the state of the garden, weed invasion can range from mild to severe! You will often need to treat paths, patios, lawns and beds for weeds when you move house, as well as weeding by hand. We can also provide you with Weedol pathclear- it’s a great time saver. Renting a property with a garden? No problem! There are still plenty of ways to create an outdoor space that feels like your own with very little cost. Pots are your ally when renting. You can get them in all shapes and sizes with different designs to customise to your own specifications. A big draw of pot gardening is that it is easy to simply transport them when you need to move house. Container gardens allow you to grow on a balcony, patio, courtyard, indoors on windowsills or rooms with adequate light. You can also grow a huge variety of plants that might not be suitable to grow in garden soil or need different soils. Pots also make planting more accessible to anyone including children, and those with limited mobility. There is also the added bonus of no weeding. This is due to the small surface area meaning it is unlikely that weed seeds will find their way into your pots. The pots can be easily moved to suit your needs and ever-changing vision for the space meaning you can change your look easily with varying colour schemes or crop rotation if you are growing vegetables. Like any other hobby, looking after a garden can be expensive, but it doesn’t have to be. We’ll provide you with the main things you’ll need, but it’s important to note that anyone can create a beautiful oasis for under £50. You don’t need to buy expensive ‘how to’ manuals, there is lots of free advice to be found online. Take a look at lovethegarden.com for some starter information. You’ll usually only need to sow a pinch or two of seeds from a packet, so save the rest for next year sealed in a foil sachet kept in a dry place or swap unwanted seed with fellow gardening friends. Better still, collect seeds from pods at the end of the season to take advantage of nature’s provisions. Good compost will save you a lot of time and energy, try using Miracle-Gro Black Magic, Levington Multi-Purpose Compost or Miracle-Gro All Purpose compost. Hopefully this post has inspired you to get your green fingers on this summer. Growing Up Parties are such a nice idea, and as long as the sun is shining, (or it’s dry at least) and you have a few drinks and nibbles available whilst you cultivate your garden, it couldn’t actually be a better activity to enjoy with you family and friends.